+ I've heard that Yorkies are prone to many illnesses? In my personal experience Yorkies are healthy when they are well-kept and looked after. I have not had any problems as my dogs are very healthy. The most common mistake people make is to change the puppy's food or feed them snacks from the table - a change in food can cause diarhoea and vomiting, which in turn results in dehydration which could be detrimental to your puppy's life. Like with most Toy breeds, there are some instances of serious diseases like liver shunt, patella luxation and a tendency to collapsed trachea (because they pull on their collar and leash - therefore use a harness). It is also said that health is linked to size. Internationally, Yorkie breeders are moving toward breeding dogs that are minimum 2kg in order to breed healthy dogs. + Are Yorkies difficult to train? Yorkies are “terriers” and can be aggressive – Yorkies can be taught to live alongside cats and other animals but proper socialization is required from puppy stage. Yorkshire Terriers are intelligent, clever and can therefore be trained as long as the training and expectations are consistent and regular. As with all small dogs, house training your Yorkie can be a challenge. + Does my Yorkie need exercise? Because of the Yorkshire Terrier’s small size and active nature, Yorkies tend to keep themselves exercised by running and playing around a small garden and in the house. Yorkies love being taken for walks (use a harness as opposed to a collar and leash) as this entails exploring new areas. Exercising your Yorkshire Terrier should be moderate. + How do I choose a healty Yorkie puppy? Healthy Yorkie puppies should have a shiny, soft, silky coat; dark nose, lips and eye-rims; bright sparkly Yorkie puppy eyes. Check for any discharge from the Yorkie puppies’ noses, ears and eyes (a bit of tearing is natural). Healthy Yorkie puppies are playful, curios, alert, confident and coordinated – check that the Yorkie puppy is not staggering or struggling to stay up right. While observing the Yorkie puppy litter, look out for any loose stool or vomit. Check that the Yorkie puppy does not have an under-bite or an overbite! + I want a Pocket or a Tea-Cup Yorkie? The hot trend is to own a Yorkshire Terrier that tips the scale at under 1.5kg when fully grown – this leads to serious concerns about the health of the Yorkshire Terrier breed. Many prospective Yorkie owners believe that there are several “types or breeds” of Yorkshire Terriers: Tea-cup Yorkies, Pocket Yorkies, Miniature Yorkies and Standard Yorkies – this is not so. 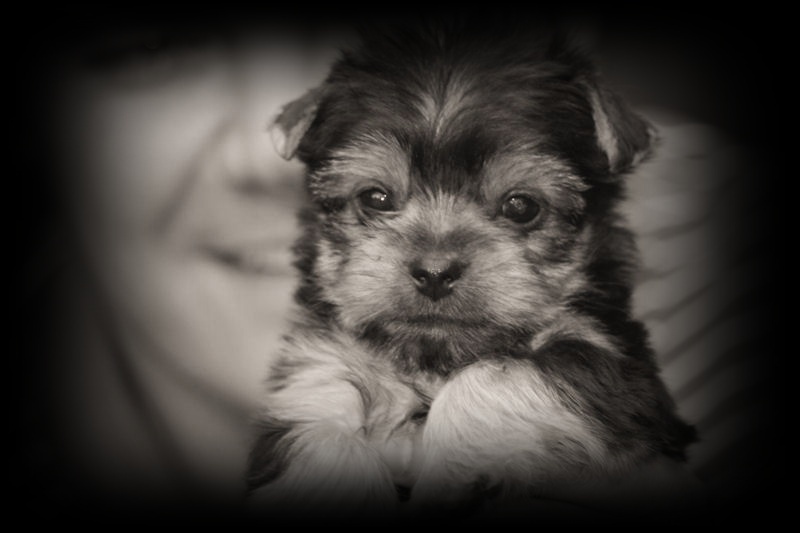 Many irresponsible Yorkshire Terrier breeders use these advertising terms to try and get the highest price (often up to R10000 per puppy) for their Yorkie puppies – and be warned – many times they sell a “pocket Yorkie” or “tea-cup Yorkie” which turns out to be a normal sized Yorkshire Terrier at adult age. It is important to know that there is only one Yorkshire Terrier breed – the Yorkshire Terrier. Like many other living creatures in life some Yorkie puppies simply grow up to be small and others grow up to be larger. The size of the Yorkshire Terrier does not in any way affect the Yorkie’s suitability as a pet. The larger Yorkies (lets quantify “large” at 2 – 3.2kg adult weight!) 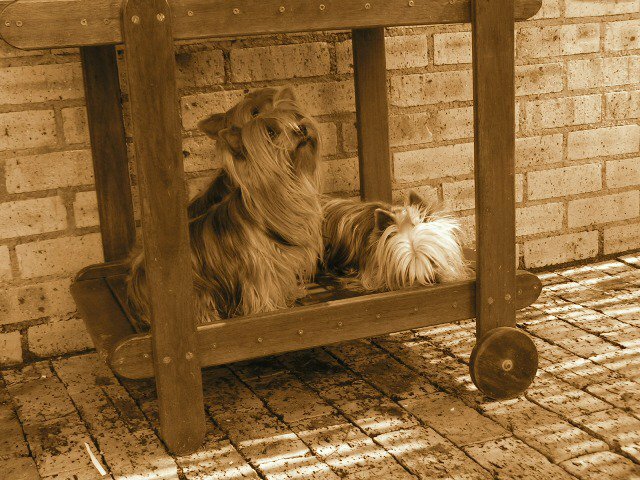 are often more suitable as pets as they are sturdier, healthier and do not need such close and constant supervision as these tiny so-called “Tea-cup Yorkies and Pocket Yorkies”. 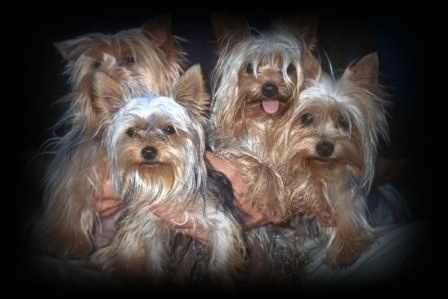 It is important to inform you as a prospective Yorkshire Terrier owner that registering bodies world-wide, The Kennel Union of Southern Africa (in South Africa) and the Yorkshire Terrier Club of America (in America) does not allow or distinguish between Tea-cup Yorkies, Pocket Yorkies, Miniature Yorkies or Standard Yorkies. As a future Yorkie owner you need to know that these very small Yorkshire Terriers pose serious health risks. Consider this: their mouths are not big enough to accommodate all their teeth, so these “tea-cup and pocket” Yorkies often end up with a double row of teeth that has to be surgically removed by your Vet when they are older. Also consider that all the normal organs (heart, lungs, liver, stomach etc) has to fit into that little “tea-cup or pocket” Yorkie body – which means that these organs are often weak and can fail suddenly. These extra small “tea-cup and pocket” Yorkshire Terriers often have problems with their blood sugar levels which means that they can suffer from hypoglycemia. Extra small Yorkie puppies are more susceptible to hereditary and non-hereditary health problems and birth defects. Extra small Yorkies are also more prone to diarrhea, vomiting and extra care and concerns are high on the radar prior to teeth cleanings and surgeries due to their poor reaction to anesthetic. These small Yorkies are also more easily injured by falls, being stepped on and being attacked or injured by other dogs. As a responsible Yorkshire Terrier breeder we do not aim to breed these extra small Yorkshire Terrier puppies. Even though we have such small puppies available from time to time they pose a high-risk and we will try and find it a very suitable home as any home is unfortunately just not suitable for these little Yorkies. The long, straight, silky Yorkie coat needs to be groomed and brushed every other day to avoid matting and tangling. It is very important to groom Yorkshire Terriers regularly to avoid ending up pulling (when trying to brush out tangles and matting) on their sensitive skins. If groomed regularly the Yorkie coat is not as time consuming as you may think. Many Yorkie owners prefer to keep their Yorkie’s coat trimmed or shaved – it is referred to as the “Yorkie summer cut or the Yorkie puppy cut” and can be done by most grooming parlors. Yorkshire Terriers look absolutely cute in this cut – but don’t do it in the winter as it is too cold! Always keep the hair around your Yorkie’s bum and groin clipped short – this way they will always be clean when going to the toilet and you won’t have the unpleasant job of having to wash a matted poo out! Many Yorkies owners like to keep the top 3rd part of your Yorkie’s ear trimmed short for a neater look. To prevent long hair from falling into your Yorkie’s eyes tie it back with a latex free elastic band or trim the little fringe. + How do I keep my Yorkie safe? Never leave your small Yorkie puppy unattended on a bed or couch as they can fall down and break their legs. Ensure your yard/garden is secure – make sure your Yorkshire Terrier can not get out (or stolen!). If you have a swimming pool – please take extra care to secure it and be very, very cautious – I cannot emphasize this enough! + What vaccinations should my Yorkie puppy get? Your Yorkshire Terrier puppy needs to get certain vaccinations from your Vet to protect him or her against infectious diseases. When purchasing a Yorkie puppy from Aziza Yorkshire Terriers you will receive a Vet Card, signed by a Vet, confirming that your Yorkie puppy has received its first inoculation. Please discuss vaccinations and the future vaccination schedule with your Vet and strictly follow the schedule. Yorkie puppies need to be vaccinated from between 6 and 8 weeks of age, until they are around 12 weeks old. The Rabies vaccination is usually given when pup is around 16 weeks old. The puppy vaccination given is called DHPP + Corona. This is a combination vaccination that gives protection against several diseases. D = Distemper is a highly contagious virus, and at one time was the leading cause of death in puppies. Young puppies are more susceptible to the virus then adult dogs. Symptoms include an upper respiratory infection with a high fever. The dog may also have neurological signs. This disease is often fatal. H = Hepatitis is a disease spread by contact with the urine and feces of infected animals. This virus causes liver and kidney damage. Dogs that survive may develop chronic illness. Symptoms include but are not limited to: fever, lethargy, anorexia, abdominal pain, and bloody diarrhea. P = Parainfluenza is a virus that causes upper respiratory infection. Dogs usually contract the disease through contact with nasal secretions of infected dogs, e.g. through sneezing. P = Parvovirus attacks the intestinal tract and causes severe vomiting and diarrhea. Parvo is highly contagious. Infection occurs through contact with an infected animal’s feces. Without treatment dogs become dehydrated and weak. Death often results. This virus is very common and puppies who are not properly vaccinated are at an above average risk of becoming infected. C = Corona virus attacks the intestinal system. Infected dogs suffer from vomiting, diarrhea and dehydration. Keep your pet vaccinated and your yard clean to protect against corona virus. + Hoe weet ek kies ek 'n gesonde Yorkshire Terrier hondjie? Hi Janine, dankie vir jou vraag. ‘n Gesonde baba Yorkie het blink, sagte hare, donker neus, lippe en ooglede en helder blink ogies. Kyk vir enige afskeiding uit die Yorkie se neus, ore en oë ('n bietjie tranerigheid is natuurlik). Gesonde Yorkie baba hondjies is spelerig, wakker, vol vertroue en gekoördineerd - maak seker dat die Yorkie hondjie nie sukkel om regop te bly nie. Kyk uit vir enige los stoelgang of braaksel en maak seker dat die hondjie het nie 'n onder- of oorbyt het nie. + My child is allergic but wants a dog - I have heard that Yorkshire Terriers might be a good option? Yorkies are non shedding dogs. Their coats are high maintenance, but virtually hypoallergenic. Like any person or animal they will lose a small amount of hair, but a lint roller (to remove loose hairs from articles of clothing) will go unused most of the time. For this reason Yorkshire Terriers are considered to be good for allergy sufferers however it is important to note that allergies vary from person to person. It is a good idea to visit a Yorkie first to see if you are allergic to it before you commit. + Wat is die Yorkie se algemene temperament? Yorkshire Terriers is meesal onbewus van hul klein grootte. Hulle is baie gretig vir avontuur. Hierdie klein hondjie is baie energiek, dapper, getrou en slim. Met eienaars wat die tyd neem om te verstaan ​​hoe om 'n klein Yorkie te behandel, is die Yorkie is 'n wonderlike metgesel! Liefdevol met hulle baas, maar hulle kan kwaai wees met vreemdelinge – daarom maak Yorkies ook uitstekende waghonde en ware terriërs! Hulle word dikwels aanbeveel vir ouer, bedagsame kinders, bloot omdat hulle so klein is. Yorkies is maklik om te lei, maar hulle kan soms hardkoppig wees as eienaars nie behoorlik die reels voorle nie, maar indien hulle verstaan waar hulle in die huishouding inpas is hulle is baie soet en liefdevol. + Are Yorkshire Terriers good watchdogs? Yorkies are alert, vigilant and therefore excellent guard dogs that will bark vigorously to warn you of a stranger's presence on your property. Hi Charmain, Hills Science Diet is 100% en bietjie hoender is ook reg. Baie mense gee ook groente, maar ek glo dat die Hills / Royal Canin droe kos al die nodige voedingswaarde het wat hulle nodig het. Hi Marnel. Congratulations on your Yorkie puppy! 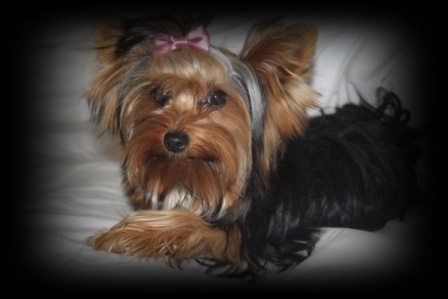 OK so lets answer the questions you have regarding your Yorkshire Terrier. You can bath your Yorkie 1 x per week. Keep his head slightly downward when washing it - this way you keep the water out of your little Yorkie's ears and nostrils. Dry his ears gently with cotton wool to remove any excess water. With regards to shampoo best suited to Yorkshire Terriers, there are a few good shampoos on the market. If you are concerned and your Yorkshire Terrier is exposed to ticks you can use a shampoo called Ultrum Plus. Otherwise I love the Biogroom and Wampum products for my Yorkies. It is especially great for the Yorkies with very long hair. With regards to food, we feed our Yorkshire Terriers Royal Canine breed specific food especially designed for Yorkies. Having said that I know Hills Science Diet and Eukanuba also produces excellent results for Yorkshire Terriers. Stick to the top brands for your little Yorkie - it is expensive, but then a Yorkie does not eat much. Please dont change the Yorkie puppy's food suddenly - if you change his food do it gradually over a few days by mixing the different brands and then slowly decrasing the one you want to discontinue. I am a firm believer that my Yorkies should not get fed scraps from the table. I realise this is a personal choice but some people find it really hard as they think they are not "treating" their little Yorkies. I find by just feeding my Yorkie bunch dry kibble and some chicken and rice on occasion that they are healthy, have healthy teeth and gums and almost never have any tummy problems. I hope that this information assists you and answered your questions. Hi Justine, thank you for your email. This is a very good question. 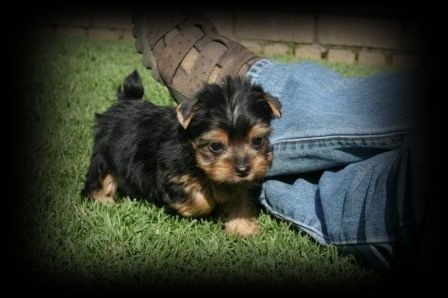 You can expect to pay between R3500 and R4500 for a Yorkie male and between R5500 and R6500 for a Yorkie female. Prices differ from breeder to breeder, but this is ball park price and what most of the top breeders in the country charge. Off course there are many Yorkshire Terrier puppies available on various free classified websites at prices must lower than indicated above. My advice to anyone who asks is always to do your homework, ensure you buy from a reputable breeder, rather than paying a cheap price and you end up with a sub-standard Yorkie. + My Yorkie is nou 5 maande oud en het baie yl hare. Haar hare is ook nog kort. Haar kleure is baie donker. (Donkerbruin en swart). Is sy 'n red legged, of gaan die hare nog groei? Hi Anette, Moenie te bekommerd wees nie – die hare sal dalk nog regkom, 5 maande is baie jonk. Party Yorkies het min hare en dan kry jy Yorkies met bosse hare – so dit verskil maar. ‘n Mens kry die donkerder Yorkie hondjies wat swart en tan bly maar onthou dat hulle haarkleur kan verander tot die ouderdom van 2 jaar oud. In jou geval is daar nog baie tyd wat moet verby gaan voordat jy rerig weet hoe joy Yorkie hondjie gaan lyk op volwasse ouderdom. Yes I remember you contacted me. It sounds like a lot of poos for one night to be honest and the fact that it is runny is not normal. It should be firm and not runny at all. The food that the breeder recommended you use is definitely not what I would recommend and probably what is causing your puppy’s runny tummy. As mentioned to you in my previous email, I believe in the top brands are Hills, Royal Canin and Eukanuba. In your case I would recommend that you start switching him slowly to Hills. Maybe you should take him to the VET and they can do some blood tests just to make extra sure that there are no bacterial infections luring around. Hang in there with the house training and be consistent – they take a long time (months) to learn where to do their business. I am not sure about the box story as this may frighten the poor little thing – personally I would not do that. Good luck with your little one – I am sure everything will turn out just fine. + Hoe voorkom ek katgriep in my Yorkie hondjie? Parvo word behandel deur vogterapie want babahondjies dehidreer baie vinnig. Parvo kan nie genees word deur slegs antibiotika toe te dien nie – dit help alleenlik met die vorming van sekondêre infeksies en maak nie die virus dood nie. Parvo affekteer die vinnig verdelende selle in die liggaam, bv die villi van die dermkanaal. Hondjies word ook met elektroliete, glukose en 'n ​​aantal ander ondersteunende medikasie behandel. Die enigste voorkoming is om jou honde in te ent! Om jou Yorkie hondjie so veilig as moontlik te hou, beveel ons aan dat jy hom / haar weghou van openbare plekke soos skole en velde (waar siek honde moontlik kon wees) en hom/haar buite kontak met onbekende honde hou tot 3 weke na die 3de inenting. 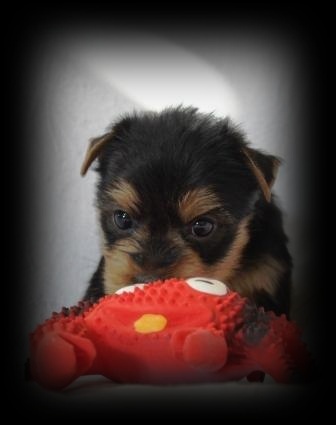 + What is the best shampoo to use for my Yorkshire Terrier puppy? All of these brands are available from your VET or VETSHOPS and off couse J&J is available at Clicks or Pick and Pay. 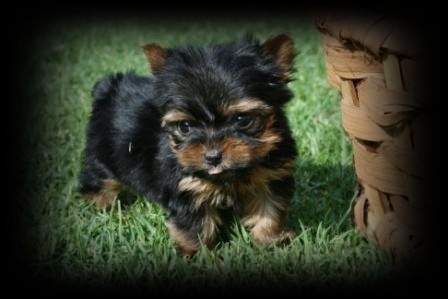 + My yorkie tefie is baie klein en weeg 1,1kg en is 3 jaar oud. Sy kry kort kort maag aandoenings. Haar stoelgang is die afgelope tyd soms baie los en partykeer is dit net so 'n blink slym met bloed in. Dit klink ook of daar klomp wind in haar derms is partykeer. Ek bly in Upington en het haar al by die veearts gehad. Ek is baie bekommerd oor haar. Kry jou Yorkie hondjie so gou as moontlik weer by die veearts. Enige slym en bloed in die stoelgang is 'n gevaarteken, abnormaal en moet onmiddelik behandel word. Gebruik jy Protexin? Dit is 'n wit poeier, vekrygbaar by jou veerarts - soos interflora - wat daagliks gebruik kan word om 'n gesonde magie en derms by jou Yorkshire Terrier te bevorder. Ek sou ook voorstel dat jy haar na 'n tweede veearts toe vat vir 'n tweede opinie - of 'n spesialis in Johannesburg of Pretoria as julle nie tot die kern van die probleem kan kom in Upington nie. + My Yorkie is baie vet - baie vet rolle om die lyfie. Het jy enige raad? Dit is baie ongesond vir Yorkies om oorgewig te wees. 'n Ekstra 500gram op 'n Yorkshire Terrier hondjie is die ekwivalent van 'n ekstra 20 kg op 'n gemiddelde mens. Praat met jou veearts oor jou Yorkie se gewig – maar ek stel voor jy sit hom op n “light” kos – verkrygbaar in die Royal Canine and Hills Science Diet reeks kosse. Moenie vir jou Yorkie gemors kos, sweets, chocolates, chips en biltong voer nie - behalwe vir die gewig issue is dit ook baie sleg vir Yorkies se tande en algemene gesondheid. Yorkies moet hulle ogies oopgesny word of moet die haartjies oor die ogies hang? Hi Martie, dankie vir jou vraag. Jy kan die Yorkie se kuifie oop sny of jy kan 'n rekkie insit en 'n strikkie maak. Hi Mel, thank you for your question. There are obviously no guarantees, but you can see at puppy stage whether they have a short or long body. They do change quite a bit during their growth stage, but I would say YES, you should be able to tell. I hope that helps.